Kent County Council’s construction of a new road link, the second phase of the East Kent Access (EKA2), on the south side of the Isle of Thanet provided a rare opportunity for Wessex Archaeology to undertake large-scale investigations of this important archaeological landscape. For thousands of years East Kent has been a gateway for new peoples, new cultures, new ideas and for trade. Kent County Council’s construction of a new road link, the second phase of the East Kent Access (EKA2), on the south side of the Isle of Thanet provided a rare opportunity to undertake large-scale investigations of this important archaeological landscape. Thanet, effectively an island from the Early Bronze Age until the 15th century AD, is now joined to the mainland following the silting up and reclamation of the Wantsum Channel. The Oxford Wessex Archaeology (OWA) joint venture project, at times involving over 150 archaeologists, undertook a series of excavations, covering 48 hectares, along the 6.5-kilometre route of the new road. This work, the biggest archaeological excavation in the UK in 2010, revealed a wealth of evidence spanning the Palaeolithic to the Second World War. Prehistoric highlights included 11 Bronze Age ring ditches − the largest possibly originating as a Late Neolithic hengiform monument, two Late Bronze Age metalwork hoards and a unique Early−Middle Iron Age trapezoidal enclosure − most likely a high status settlement or sanctuary. 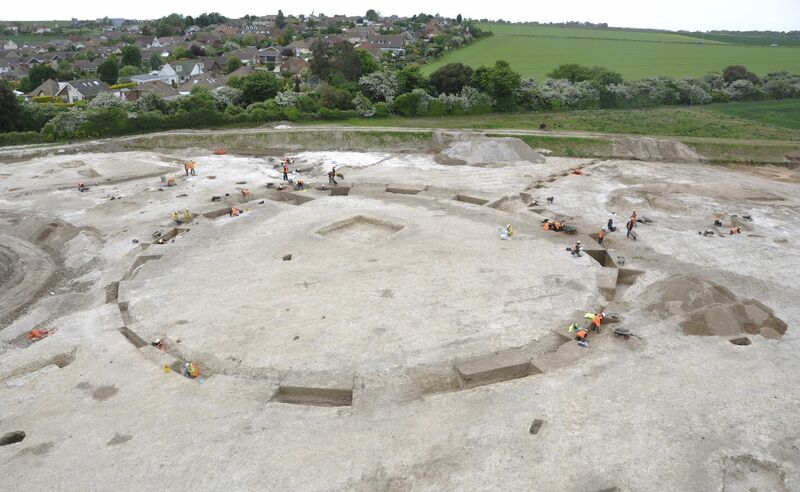 The discovery of a large, ditched enclosure of mid-1st century BC date on the Ebbsfleet peninsula was probably the most significant discovery of the entire EKA project, with a possible link to Julius Caesar. Evidence for subsequent Romano-British settlement and burial was extensive, while two early Saxon cemeteries and a rare Mid-Saxon settlement represent further important discoveries. Community outreach formed an important and integral part of the project from the outset. This included a wide-ranging programme of events including open days, school visits, roadshows and public talks, as well as the community excavation of one of the Early Bronze Age ring ditches. The results of the work were published in 2015, but that did not mark the end of the EKA project. The paper and electronic records, as well as the large number of finds, have been prepared for long-term storage, and further excavations have taken place. The discovery of what may have been a temporary camp constructed by Julius Caesar during his second visit to these shores in 54 BC has led to a major new research project, based at Leicester University funded by The Leverhulme Trust. This has involved re-evaluating all the evidence for Caesar’s expeditions, as well as new fieldwork on the Ebbsfleet peninsula in 2015−17. Though it may never be demonstrated conclusively, the accumulating evidence for this being his landing place and initial base in Britain is persuasive. The results of the excavations are published in two volumes. You can also download a booklet which illustrates the story.